Personal injury lawsuits range from medical malpractice to severe injuries caused by auto accidents. Some of these settlements will be larger than others due to the details and documentation about the incident that caused you or a loved one harm. 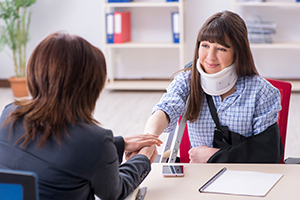 Legal Capital Corp works closely with your attorney to provide a cash advance on your personal injury settlement, so you don’t have to go through financial struggles on top of recovering physically while your case goes through the court process. 1. Document Every Aspect of the Incident. Whether it was wrong-site surgery, or you were in an auto accident with a drunk driver and sustained irreversible injuries, you’ll need documentation to back up your claim and maximize the sum of your settlement. A skilled personal injury attorney who specializes in your type of claim can help you compile this data. He or she will then be able to share that information with Legal Capital Corp where we will assess its merits and provide an immediate decision. If your application for a cash advance is approved, you will have cash in hand within 24 to 48 hours. 2. Assess Your Current Financial Struggles. A cash advance is often required for victims who are unable to work or lost weeks of wages due to their injuries. You will need to maximize your cash advance by paying essential bills off first such as rent and other costs of living. You may want to establish a plan to make your advance last as long as possible including plotting out how much you’ll need each week for groceries, childcare, etc. Our cash advances are provided at a low, flat-fee so you won’t need to pay back a large sum if your case takes longer than one year to resolve. 3. Follow Through with Medical Care. Medical care including physical therapy is an ongoing process for personal injury victims. It’s essential for your health but also your case that you make it to all of your appointments and continue appropriate care and precaution in everyday life. In some cases, you may need to make home modifications for wheelchair access. In the interim, your cash advance can help you address the high cost of continued medical care, hospitalization, and recuperation. Legal Capital Corp works with clients in Chicago, New York, and around the country during their most vulnerable times. We know the financial strain that comes with severe personal injuries caused by the negligence of someone else, and we work with you during this difficult time to ensure your basic bills and needs are met while your attorney fights on your behalf through the claims process. If you’ve been injured and are in need of a cash advance on your settlement, please fill out our online application to get the ball rolling or contact us in New York or Chicago at (844) 239-3551 today.